The trades love talking about tools! Tradespeople from around the UK (and beyond) joined in the #TradesTalk Twitter chat and this week record numbers got involved to talk all things tools. Participants in the chat discussed their favourite tools and swapped tips and advice, many sharing pictures of their tool bags. Here is our round-up of the best bits from the chat, starting with a question about recent purchases. If you keep kit in bags/boxes chuck some of the Silica Gel bags you find in other things in there with them. The third question looked at researching new tools, and PB Plumber was mentioned more than once as a source of inspiration, as were trade shows like Toolfair. 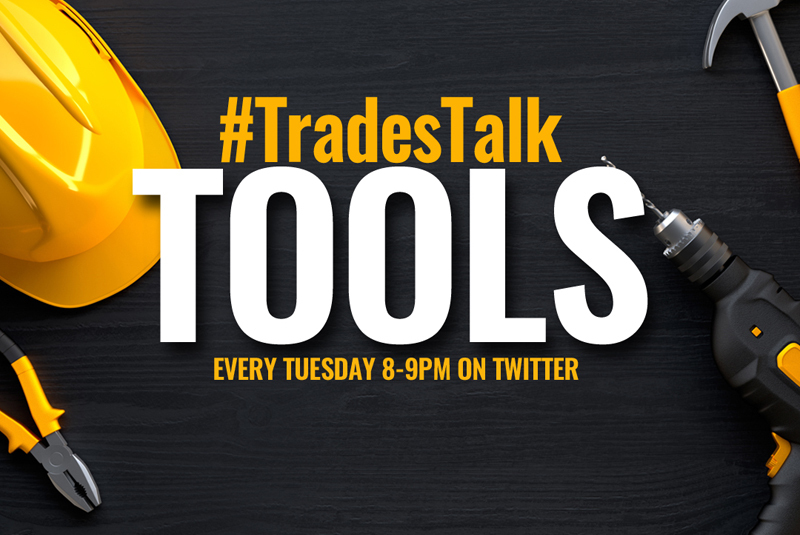 If you’d like to talk to other trades about tools and much more besides, #TradesTalk takes place every Tuesday at 8pm on Twitter. And there’s a special #TradesTalk Live taking place at PlumbExpo at Alexandra Palace on January 30th.